Illinois' Isaiah Martinez pops off after his victory over Kent State's Ian Miller during the match at Huff Hall on Sunday, February 15. The Illini won 38-0. 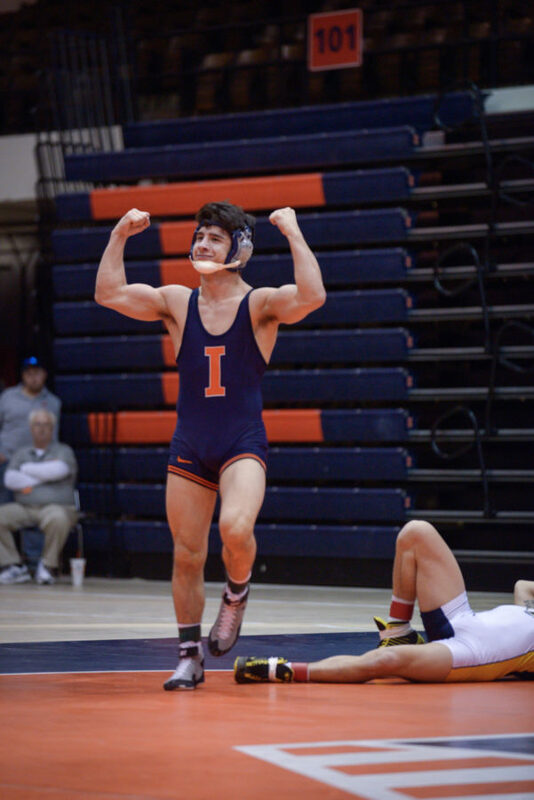 Redshirt freshman Isaiah Martinez of the Illinois wrestling team just completed a 35-0 season and won a national title in the 157-pound weight class. This week I sat down with him to talk about his perfect season and his off-the-mat hobbies. Kevin McCarthy (KM): Describe the moment when the referee lifted your hand in victory, and you were officially crowned national champion. Isaiah Martinez (IM): Wow. I don’t know, honestly. How do you describe the culmination of 15 or 16 years of work? All for that one moment: the glory. It was almost a relief in a sense. But it was overwhelming too for a while. KM: There’s an awesome picture of you, (Head coach) Jim Heffernan, and (associate head coach) Mark Perry embracing each other after the national championship match. What was going through your mind during that moment? IM: They’re the ones that got me here. They spent countless hours in the gym with me. They helped me through some struggles, some highs and some lows. But they believed in me throughout the entire journey. I was just grateful for them in that moment. KM: What’s your relationship with Mark Perry like? IM: I have a great and very unique relationship with all of my coaches. With Mark, he’s more of a brother to me. He’s not afraid to tell me the things that I don’t want to hear. I’m very grateful for that bond we’ve built. KM: Since Mark has been there, done that — he won two national titles himself at the University of Iowa — how does that make him a better coach? IM: You just respect what he’s done. When you’re trying to be the best, you want to emulate someone who has done it before. I used to see videos of Mark when I was growing up. What he’s done on the mat makes you respect him. He faced a lot of adversity (with injury) winning two straight national titles. It gives him a certain aura and confidence — it makes you want to be like him. KM: In the beginning of the season you told me that you wanted to go undefeated and win a national title. Now you’ve done just that. Did you truly believe you could do it? IM: (Laughs) I did. I did. Just because I believed it doesn’t mean that it wasn’t astonishing to me when it actually happened. To go undefeated, set my weight class on fire, and just dominate everyone — I didn’t think it would be like that. Maybe I was just talking. Looking back, it still amazes me. KM: What separates you from the rest of the competition? IM: I’m not afraid to work very, very hard for what I want. I’m stubborn and aggressive. I just believe that I can be the best as long as I listen to my coaches. KM: People are already making comparisons with you to the greatest of all time — Cael Sanderson — who went (159-0) in college. How does that make you feel? IM: It’s really cool, I think it’s awesome to hear my name in the same sentence as the greatest collegiate wrestler of all time. I never could’ve imagined this. It’s wild. KM: Do you believe that you can be the next Cael Sanderson? IM: I want to exceed him, honestly. I look to someone like that and I want to emulate what he did, but it’s about setting your own legacy. I want my name to come out and people to be like, “He was better than Cael Sanderson.” I have a long way to go. It’s going to be very hard. But if I stay the course, I don’t see why I can’t do it. KM: I keep seeing photos of you taking pictures with kids or signing autographs, what has that been like? IM: It’s cool! These kids are crazy sometimes with the kind of stuff they want me to sign. Yesterday, some kid had a pair of Jordan Burroughs’ (an Olympic wrestler) shoes, and he’s like, “Sign these for me.” I’m like, these are Jordan Burroughs’ shoes, I feel guilty. It’s crazy being that guy that kids look up to, because I used to be one of those kids. KM: Who’s the toughest guy on this team? IM: Definitely (senior) Jesse Delgado. KM: Do you play video games? IM: Yes. I love Mortal Kombat and Super Smash Bros.
KM: If Isaiah Martinez was a Super Smash Bros. character, who would you be? IM: I would definitely be Captain Falcon. He’s an all-in type of guy. He’s super strong and just tries to “Falcon Punch” everyone. KM: So you’d do a lot of Falcon-Punching? IM: Oh yeah. I’d Falcon Punch and Falcon Kick everybody. KM: How would I look in wrestling head gear? IM: No one looks good in head gear. KM: If I stepped on the mat with you, how long would it take you to pin me? IM: (Laughs) That wouldn’t be a good idea by you. I’m not a pinner. But I could pin you very, very fast. KM: Well, how long would it take you win by technical fall? KM: Why did you move from Southern California to central Illinois? IM: I ask myself that question every day in the Winter. KM: Let’s end on a more serious note. In a single word, are you going to win four straight national titles?